The findings discussed in Meaningful Differences in the Everyday Experience of Young American Children have been cited more than 8,000 times, according to Google Scholar. NPR talked to eight researchers to explore this controversy. All of them say they share the goal of helping poor kids achieve their highest potential in school. But on the issue of how to define either the problem, or the solution, there are, well, very big gaps. With all that in mind, here are six things to know about the 30 million word gap. 1. The original study had just 42 families. During the War on Poverty in the 1960s, Betty Hart, a former preschool teacher, entered graduate school in child psychology at the University of Kansas, working with Todd Risley as her adviser. The two began their research with preschool students in the low-income Juniper Gardens section of Kansas City, Kan., explains Dale Walker of the University of Kansas, who counts Hart as a colleague and mentor. "They definitely worked out of their personal concern and experience with young children." Seeing differences between poor and middle-class children by the age of 3, Hart and Risley decided to look for roots even earlier in children's lives. Beginning in 1982, they followed up on birth announcements in the newspaper to recruit families with infants as research subjects. They eventually chose 42 families at four levels of income and education, from "welfare" to "professional class." All of the "welfare" families and 7 out of 10 of the "working class" families were black, while 9 out of 10 of the "professional" families were white — this will be important later. Starting when the babies were 7 to 9 months old, the researchers visited each house for one hour, once a month, for 2 1/2 years. They showed up generally in the late afternoon, with a cassette recorder, a clipboard and a stopwatch and tried to fade into the background. They were there to record the number of words spoken around the children, as well as the quality and types of interaction (for example, a question versus a command), and the growth in words produced by the children themselves. 2. The study has been cited over 8,000 times. After 1,200 hours of recordings were collected, the real work began. Transcribing and checking each moment, with their elaborate system of coding, took 16 hours for every hour of tape, Dale Walker explains. Hart and Risley's study wasn't published until 1992, while their book, Meaningful Differences in the Everyday Experience of Young American Children, came out in 1995. From there, it really caught fire. These findings have been cited more than 8,000 times, according to Google Scholar. The book remains one of its publisher's bestsellers more than 20 years later. There is a national research network of over 150 scholars aligned with Hart and Risley and focusing on young children's home environment. And the impact of this work spread far beyond the ivory tower. "It's had enormous policy implications," says Kathy Hirsh-Pasek, a developmental psychologist at Temple University and a senior fellow at the Brookings Institution. Something about that figure, 30 million words, held people's attention. Not only was it big, it seemed actionable. Speech — unlike books or housing or health care — is free. If we could somehow get poor parents to speak to their children more, could it make a huge difference in fixing stubborn inequities in society? The "word gap" drove expanded federal investments in Head Start and Early Head Start. Hart and Risley's work inspired early intervention programs, including the citywide effort Providence Talks in Rhode Island, the Boston-based Reach Out and Read, and the Clinton Foundation's Too Small To Fail. Both researchers are now deceased. But in Kansas City, where it all began, Dale Walker and others work on research and interventions at the Juniper Gardens Children's Project. 3. Thirty million words is probably an exaggeration. Maybe the gap is 4 million. Maybe it's even smaller. That eye-popping figure is one of the reasons the study has been so sticky over time. But newer studies have found very different numbers. Since Hart and Risley's study was published, critics have taken issue with how the data was collected and interpreted. "Their study is commendable in many ways, but they just got it wrong," says Paul Nation, an expert in vocabulary acquisition at Victoria University of Wellington, New Zealand. Nation primarily takes issue with the idea that you can estimate vocabulary growth from small samples of speech, particularly when the samples don't contain the same number of words. He is one of many to have pointed out that the low-income families in their sample may have been intimidated into silence by the presence of a researcher, especially someone of another race. Educated parents, though, might be more likely to show off by talking more when an observer is present. Modern technology can get around this observer effect. A nonprofit called LENA manufactures a tiny digital recording device that can be worn by children as young as 2 months old. Software then estimates speech and turn-taking. While not invisible, it's a lot less intrusive than having a person sitting in the room. Directly inspired by Hart and Risley, LENA is used in school-based and home-based interventions dedicated to closing the word gap in more than 20 states. Using LENA, scientists published a near-replication of the Hart and Risley study in 2017, only this study had 329 families, nearly 8 times more, and 49,765 hours of recording, from children 2 months to 4 years. Their conclusion? The "word gap" between high-income and low-income groups was about 4 million by the time the children turned 4, not 30 million by age 3. Only if you compared the most talkative 2 percent with quietest 2 percent of families did you get a gap nearly as wide as Hart and Risley's, says LENA's senior director of research, Jill Gilkerson. Another just-published study calls itself a "failed replication" of Hart and Risley. The researchers analyzed field recordings from five different poor and working-class communities. They found that the amount of speech children heard varied from one place to another. The lowest-income children recorded in South Baltimore heard 1.7 times as many words per hour as did Hart and Risley's "welfare" group. And in the "Black Belt," an area in rural Alabama, poor children heard three times as many words as Hart and Risley's "welfare" group. The wide variation "unsettles the notion that income alone determines how many words children hear," lead author Douglas Sperry tells NPR. 4. Some people take issue with the whole idea of a "gap"
Sperry and his co-authors fall into a camp that criticizes the "word gap" concept as racially and culturally loaded in a way that ultimately hurts the children whom early intervention programs ostensibly trying to help. "To look at income alone obscures real questions about the cultural mismatch between children of color and mainstream European children and their teachers as they enter schools," says Sperry. In other words, it's not necessarily that poor children aren't ready for school; it's that schools and teachers are not ready for these children. 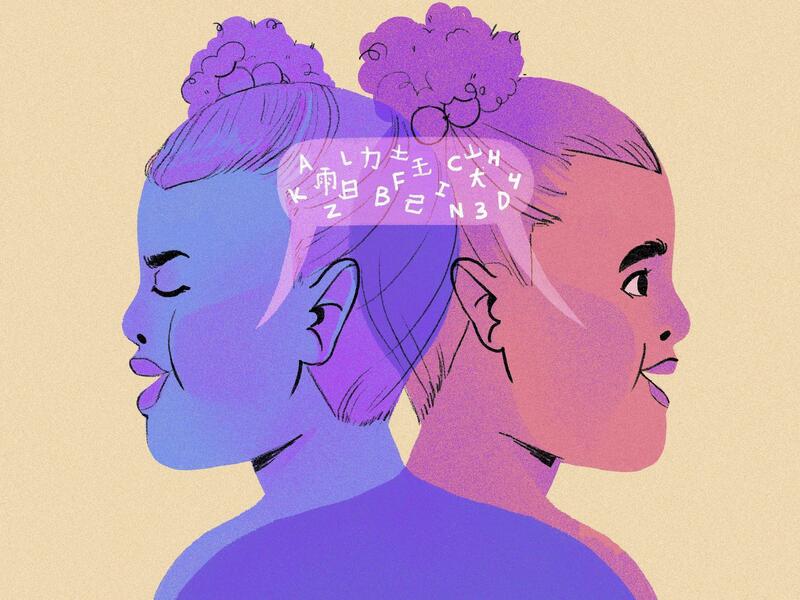 Marjorie Faulstich Orellana, a professor of education at the University of California, Los Angeles, has called attention to the "word wealth" experienced by children who grow up learning a different language or even a different dialect than the dominant standard English spoken in school. This would describe not only recent immigrants, but also anyone whose background isn't white, educated and middle or upper class. When they get to school, they must learn to "code switch" between two ways of speaking. She doesn't disagree that "there's variation in how much adults speak to children," but, she tells NPR, there shouldn't necessarily be a value judgment placed on that. "Should adults direct lots of questions to children in ways that prepare them to answer questions in school?" she asks, calling that a "middle-class, mostly white practice." "There are other values, like using language to entertain or connect, rather than just have children perform their knowledge. How do we honor different families rather than have families change their values to align with school?" Similarly, Sofia Bahena, an education professor at the University of Texas, San Antonio, says talking about "word gaps," like "achievement gaps," is an example of what she calls deficit thinking. "We can talk about differences without resorting to deficit language by being mindful and respectful of those we are speaking or researching about," she explains. "We can shift the question from 'how can we fix these students?' to 'how can we best serve them?' It doesn't mean we don't speak hard truths. But it does mean we try to ask more critical questions to have a deeper understanding of the issues." Jennifer Keys Adair at the University of Texas, Austin published a study last year of how the "word gap" rubber is meeting the road of schools. She and her co-authors spoke with nearly 200 superintendents, administrators, teachers, parents and young children in mostly Spanish-speaking immigrant communities. The educators expressed the belief that the children in grades pre-K through third in this community could not handle learner-centered, project-based, hands-on learning because their vocabulary was too limited. And, the children in the study themselves echoed the belief that they needed to sit quietly and listen in order to learn. Adair says the "word gap" has become a kind of code word. "We can say 'vocabulary.' We're not going to say 'poor' and we're not going to use 'race,' but it's still a marker." Walker says that Hart and Risley were happy to engage with their critics. "They valued that input and the give and take." But, she says, they were sometimes "dismayed" at misinterpretations of their research, such as if people took ideas about the importance of an early start as justification for not trying to improve student outcomes later on in school. Some boosters agree with critics that the "word gap" may need a reframing. Kathy Hirsh-Pasek, with her longtime collaborator Roberta Michnick Golinkoff and other researchers, wrote a scholarly critique of the Sperry study for the Brookings Institution. "I am worried," Hirsh-Pasek tells NPR, that downplaying the word gap will have "dangerous" consequences. "Whenever you send out a message that 'Hey, this doesn't matter,' the policymakers are listening and say, 'Hey, that's great, we can divert the money.' "
Sperry's measures included "bystander talk" by multiple people in the room, including older siblings and other relatives. So did the LENA study. Hirsh-Pasek says the psychological research is clear that it's the "dance" of interaction between caregiver and child that is crucial to learning speech. While this point is fairly settled among developmental psychologists, anthropologists may dissent, says Douglas Sperry. In some cultures, such as the Mayans in Central America, addressing young children directly is uncommon, yet people still learn to talk, he notes. Hirsh-Pasek does agree with the critics that framing the issue as a deficit is wrong. "I'm so sorry that the 30 million word gap was framed as a gap," she says. "I like to talk about it as building a foundation rather than reducing a gap." But, she adds, the sheer volume of conversation directed at children, not just spoken in their presence, is fundamental to language learning and later success in school. All the cultural variation in the world "doesn't negate the fact that when you look at the averages, there is a problem here." And what's most important, says Hirsh-Pasek, is that interventions inspired by Hart and Risley are nudging parents in the right direction. "We have made changes and movement in kids, in whole communities." We're going to talk now about something our next guest says we should all stop talking about - the 30-million-word gap. That is the finding that kids who grow up in poverty hear 30 million fewer words by age 3 than those in wealthier families. For decades, this finding has shaped how teachers and policymakers approach child development. So let's bring in NPR Ed team's Anya Kamenetz to explain why. She says it may be time to move on from the 30-million-word gap. Hey, Anya. KELLY: Hey. So first just walk us back. Where did this 30 million figure come from in the first place? What was the research? KAMENETZ: So Betty Hart and Todd Risley at the University of Kansas wanted to know why the poor children in preschool that they were working with seemed to be so far behind at such a young age. So starting in the early 1980s, they went to homes in Kansas City. And for one hour per month, they recorded these families starting when they had babies up until they were 3 years old. And the difference that they found was huge. The professional-class parents in the study spoke more than triple the words per hour to what they called the welfare-class families. And we talked to Betty Hart back in 2011, who told us her initial reaction. BETTY HART: Horrified when you see that the differences are so great and you think of trying to make up those differences. You just look at it and say, you know, it's hopeless. KELLY: But researchers and policymakers thought actually this could be quite hopeful. This is a fixable problem. And it drove investment to try to fix this, right, Anya? KAMENETZ: That's right. People were excited because this seemed actionable. You know, speech is free unlike health care or education. So parent education efforts like federal Early Head Start Programs, Providence Talks, the Clinton Foundation's Too Small to Fail - all of these were inspired by the Hart and Risley 30-million-word study. KELLY: So this seems like a great idea - trying to figure out ways that parents engage more with their very young children. Why are you making the case that we should stop talking about this 30-million-word gap? KAMENETZ: Well, critics for years have said that the number itself might be exaggerated. So the sample size in the study was just 42 families, and many have pointed out that having a researcher sit in your living room might not be the most natural situation. And, you know, there was a racial element to this as well because all of the welfare-class families and nine out of 10 of the working-class families in the study were African-American, and they had people in their living rooms who were of another race. They might have been intimidated. And then just a couple of weeks ago, a study came out that was called a failed replication of Hart and Risley. It compared field recordings in different communities and found that the level of conversation kids heard really varied based on the area, not just on the income level. And so, for example, in the Black Belt area of Alabama, these kids heard three times as many words as in the Hart and Risley study. KELLY: I gather also there's some controversy just over the term we're using, the 30-million-word gap. KAMENETZ: When we talk about gaps, it's a deficit model of thinking. It focuses people on, you know, what these kids are doing wrong, what their families are doing wrong rather than how, you know, systems like schools could be meeting their needs better. And so, for example, there was a really interesting study done last year where they talked to educators in mostly Spanish-speaking communities and found that this word gap idea had kind of penetrated people's minds and gotten them to kind of think that these kids didn't have the vocabulary to handle really kind of hands-on, engaging learning. And so this is an example of, you know, maybe science getting into people's heads in a way that might not be completely beneficial. KELLY: NPR's Anya Kamenetz, thanks so much. KAMENETZ: Thanks, Mary Louise. Transcript provided by NPR, Copyright NPR.